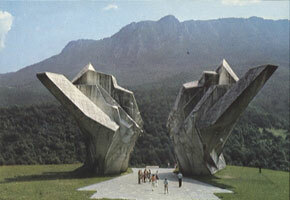 Sutjeska National Park is one of the oldest parks in Bosnia and Herzegovina and a perfect tourist destination. Sutjeska National Park also has one of two last primeval forests in Europe. View the highest peak in Bosnia and Herzegovina. Hike the Zelagnora Mountain for a real thrill, which rises 2,386 meters high (7828 feet). Be prepared to see wildlife, including bears and even wolves, but don’t worry—you won’t have to hike down the same day! The mountain is equipped with huts to stay the night. Zelagnora Mountain, or Green Mountain, is well-known for its glacial lakes, so if you love clear, cool pools, go there on your vacation to Bosnia and Herzegovina. Visit Orlovacko Lake, which you can drive to, and then hike a few hours to Bregoc, which is Zelagnora’s highest peak. Enjoy the beautiful view and don’t forget to bring snacks and supplies! Skakavac Waterfall gives onlookers a stunning view in a relaxed atmosphere. This waterfall totals seventy-five meters (240 feet) amidst towering beeches and black pines. This setting offers a wealth of photographic opportunities, so don’t even think about leaving that camera behind. *Be aware of your surroundings. It’s easy to get engrossed in the views and natural surroundings, but be careful to bring a map and follow marked signs. Stay in Tjentste at the Hotel Mladost, and then head to Sarajevo afterwards for more sightseeing and a chance of pace from the wilderness. Kozara National Park , which has been called the “Green Beauty of Krajina,” was named a national park in 1967. Despite its beauty, this green and lush area between Sava, Sana, Una, and Vrbas Rivers has a historically significant past as well. This area became a battleground during the second World War when Partisans snuck through the hills to take advantage of the Germans. Leisurely walks are best way for nature lovers to enjoy Kozara National Park. Bring a bicycle, walk, or hike through Kozara’s hilly terrain. *Kozara National Park offers slightly less grueling paths for those who like light and easy walks instead of more challenging trails. *Keep an eye out for boars, wild ducks, deer, and fox—and don’t forget your camera! Stay in a nearby bungalow or suite to fully enjoy what Kozara has to offer. Find private lodging at small hotels on the way to Kozara National Park in Mrakovica.